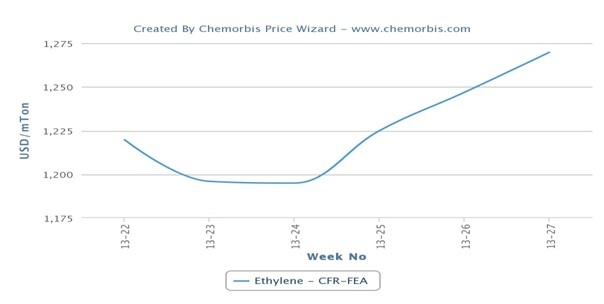 Spot ethylene prices moved higher across major global markets supported by firmer energy costs. Crude oil prices on the NYMEX have spiked around $7/barrel over the past week to reach a 14 month high due to the political unrest in Egypt. The 6.9% weekly surge in crude prices was the largest since February 2011. In Asia, spot ethylene prices on a CFR Northeast Asia basis have climbed around $10/ton on the week while they represent a larger increase of $85/ton when compared to early June levels. 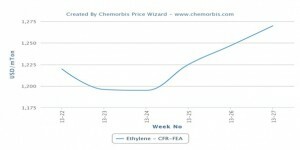 Higher ethylene prices were attributed to firmer upstream costs. Spot naphtha prices in the region gained around $30/ton from last week on the back of improved buying interest. In production news, Taiwan’s Formosa Petrochemical is planning to start a planned maintenance shutdown at its No 2 steam cracker at Mailiao in the middle of September. The cracker, with an ethylene capacity of 1.03 million tons/year, is expected to remain offline until the end of October. Spot ethylene prices in Europe rose €30/ton when compared to last week while they suggest a larger hike of €90-95/ton from the levels reported at the beginning of June. Healthy derivatives demand was cited as another reason behind higher prices. In the US, the spot ethylene market climbed up by around $40/ton (1.75 cents/lb) from last week. Production issues at some producers, including Dow, Westlake and Shell Chemicals, were cited as the main reason behind the rise in the spot market. Despite firmer spot values, ethylene contracts fully settled 5.2% lower for April, May and June, marking the first three month settlement since 2009. The contracts started settling down by $17/ton (0.75/ton) for April and they were concluded with a total decrease of 2.5 cents/lb ($55/ton) over March. Special show at K 2013: "Plastics move the world"